I particularly like this genus. For one, they’re herbivores, feeding on algae and aquatic plants. They’re also a very weird shape relative to the other water scavenger beetles. Rather than a long, sleek domed top and a sharp spike on the flattened bottom, these beetle are much more bulbous and round. I think they’re just adorable. Their best characteristic though, in my opinion, is the sound they make. They have a delightful squeak, loud enough to be noticeable without being overbearing, and swim about very quickly while making the sound. I love that little squeak! In fact, I can tell immediately when I have scooped one out of the water, no matter how much vegetation and other critters I pull out with them, based entirely on their sound. 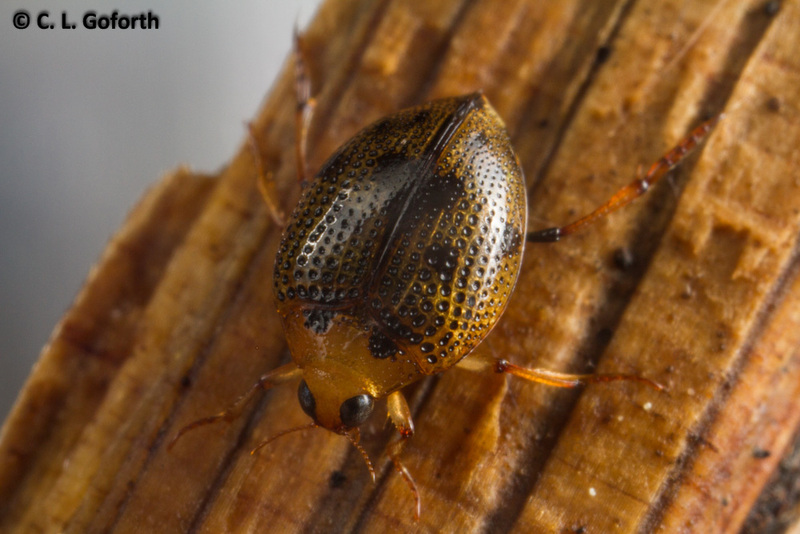 That’s a crawling water beetle in the genus Peltodytes. They seem to bury themselves in the rocks, dash up to the surface periodically with lightning speed, and then zip back down into the rocks. SO hard to photograph! But I happened to look into my tank and it was sitting on one of the little pieces of wood in my tank above the water line. And it just sat there! I was able to get about 6 shots before my movement, the flash, or both scared it back into the water, but I got some decent shots of this stupid little beetle after several years of trying. I was thrilled! Pumped my fist in the air and grinned like an idiot once it disappeared back down into the rocks. A triumph for sure! 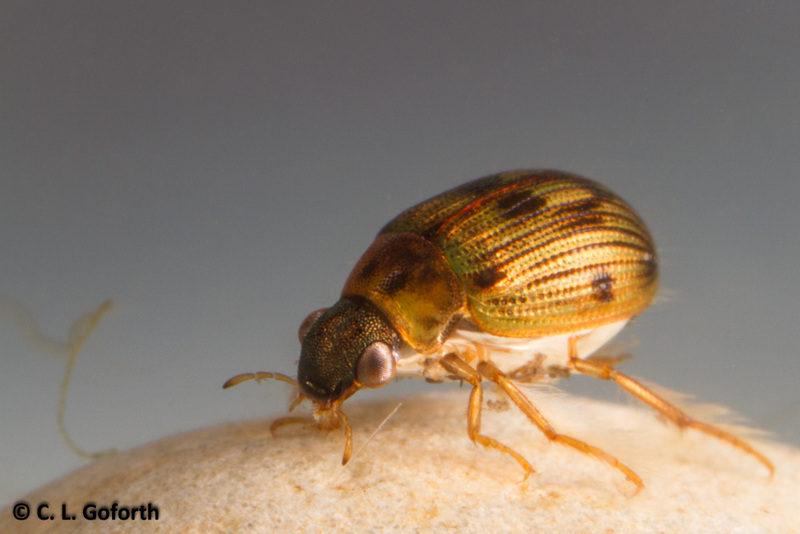 So, TWO major aquatic beetle photography accomplishments in one day! I am so excited to have gotten these. I’ll keep trying to get even better shots, but I consider this a good day’s photography for sure. Now that my class is over, I’m definitely not going to be posting everyday anymore. This pace is one I just can’t keep up with! However, I’m going to try to get back into my 3 or 4 posts a week habit and keep that going for a while. We’ll see how long I can keep that up, but I’m feeling good about the little jump-start this class provided. Just what I needed to get back into the blogging habit! Great shots of beautiful water Beatles. Do the dots on their shells have anything to do with breathing? They like like jewelry pieces. Love them! Will miss your every day photos, but realize you have a life and are incredibly busy. Thank you for the pics and info. Nope, they both store air underneath their bodies and use that to breathe. I don’t know what the little holes in the elytra do for them – maybe help them swim? The gold color is so beautiful! The hidden beauty of nature. Lovely! Thanks for sharing. You’re very welcome! Thanks for taking a look at them. Thank you – and to you as well! Congratulations! Those are some beautiful little beetles! Thanks! I’ve been trying to get some clear shots of these for so long that I was beyond thrilled when to get both of these in one session. What are the odds really?